PROVIDENCE, RI--(Marketwired - Dec 3, 2013) - Laser Research Optics has introduced custom laser optics that can be made from zinc selenide and zinc sulfide in virtually any shape and size, with precise tolerances and surface finishes. Laser Research Custom Optics can be supplied plano-convex, plano-concave, and as wedged-windows and mirrors in round, rectangle, and square shapes that can include steps, holes, and other special features. Manufactured to specification from ZnSe and ZnS in sizes from 1/2" to 5" O.D., they can be coated to achieve specific wavelengths from 8 to 12 microns typical. Conforming to ISO ISO-10110 specifications, Laser Research Custom Optics can be fabricated in a variety of thicknesses with typical dimensional tolerances of ±0.001 to ±0.005". Surface finishes of 10 waves to 1/10th wave flatness and 10-5 to 80-50 scratch-dig can be provided for these zinc selenide optics and zinc sulfide optics. Laser Research Custom Optics are priced according to configuration, material, and quantity. Price quotations are available upon request. 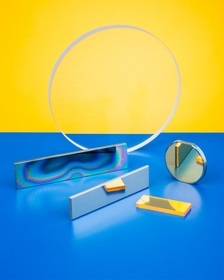 Laser Research Optics is a division of Meller Optics, Inc., a leading manufacturer of hard crystalline materials such as ruby and sapphire since 1921. The company maintains one of the largest inventories of stock CO2 optics in the country. Available for immediate delivery, the optics are ideal for direct field replacement in low power CO2 lasers currently being used for laser marking, laser engraving, laser cutting, and low power scribing and welding. Custom laser optics can be made from zinc selenide and zinc sulfide in virtually any shape and size, with precise tolerances and surface finishes.